This week has become a bit of a weird one, because Espen has been sick with a stomach bug. And so we have placed ourselves under house arrest until he is back to normal again. In light of this, we won't be doing our usual toddler activity post next week, because our activities have mainly revolved around reading books and watching hours and hours of cartoons. However, we did find time for a little before Espen got sick that I thought you might like to see. It might make sense to kick this off by stating that not only may it be a little nuts to try to teach a 19-month old the alphabet, I am also in no ways academically trained to do so. Having said that, I feel like being Espen's mother qualifies me to say that this little boy is interested and ready to learn! So I decided to put together a little lesson on the first letter of the alphabet for him. I had seen Alison of Oopsey Daisy's Mommy School posts, and felt hugely inspired by them. I think it's so cool how she recognizes her toddler's potential for learning and goes with it. I knew I wanted to start with the alphabet, so I took some inspiration from Alison's alphabet lessons, and put together my own little lesson. I started by gathering up a variety of objects from around the house that began with A. I also cut out two large paper A's, and printed off a coloring page from the Sesame Street section of PBSkids.org, and got out our alphabet books for some context. I put this all together while Espen was napping, and stuck it all in a bag for extra interest/surprise/attention-holding. A is for apple, alligator, avocado, apple sauce, angry and amazed. And for another apple and also an alligator. After lunch Espen played right into my hands by asking to color. So we got out paper and crayons, and drew a big, blue A. "This is an A", I told Espen. He was OK with that. Then I drew some more things that started with the letter A, like "arm", "ant" and "apple," and we talked about them. Within about 2 minutes, Espen was pointing to the A's and saying "ay!" I was surprised by how quickly he caught on. Clearly I missed my vocation in life. Shoulda been an artist - just look at that ant! Then I pulled out the bag and showed Espen the objects inside, describing how each of them starts with an A. "A is for Apple. A is for avocado." I'm not sure how much of this he actually got, but he was interested and having fun, which, I think, is the most important thing at this point. Then we got out the paper A's, one for me and one for Espen. I hung mine on the wall in the kitchen, leaving room for the rest of the alphabet if we get that far. Espen carried his around, singing "ay ay ay" for a good hour afterwards. 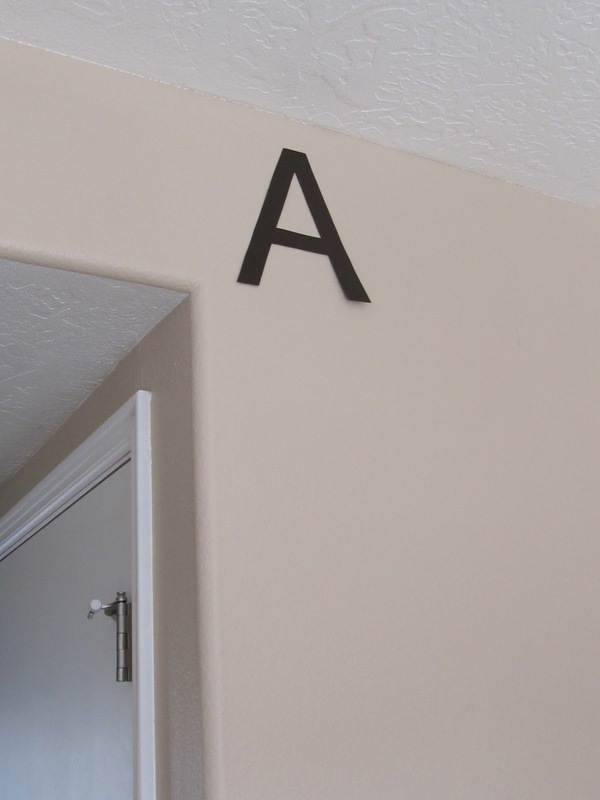 A little tip: I chose a font that I like (Helvetica) in a color that works well with our wall color. That way I won't mind having a bit of pre-pre-school flava to our kitchen. I'm hopeful that if and when we make it through the alphabet, we'll have a cool little wall mural going on. Or a mangled collection of chewed up paper scraps. Then we finished up the lesson by coloring the Sesame Street picture and watching a couple of Youtube videos about the Letter A, which Espen really loved. I felt like seeing the videos address the things we had been talking about really helped solidify the things we had been talking about in his mind. Including preparation, I probably spent about half an hour on this whole thing. The most time-consuming part of that was probably printing and cutting out the A's. The actual "lesson" probably lasted about 10 minutes, which was just right for what I had planned and for Espen's attention span. I think we will definitely be doing the other letters of the alphabet, but not on any sort of rigid schedule. Espen is just too young to have his days planned and rigorously scheduled for him yet, but when we're looking for something to keep us busy, we'll do the rest. It was fun for me too, and I enjoyed coming up with, and putting together, our little letter activity. What do you think? Is 19 months too young for "formal" learning like this? Do you teach your kids at home, or do you feel like school will come quickly enough for all of that? And if I do more lesson "plans" like this, would you like me to post them here? As long as you make it fun...its never too early to expose them. I hope he feels better soon! I think that is wonderful!! The lesson was so simple & short enough that it's completely fine. It's not like you have his whole day planned w/ school lessons. Love it! Where did you get those emotion cards? What a good mama! No!!! Believe me ... 19 months is not too early at all! It would be too early if it was 'forced learning' which you are NOT doing! ;-) You're making it fun, exciting and on his level! YOU GO GIRL!!! I don't think it is too early at all! I love this idea. I work with Landon on stuff like this a lot. He LOVES his ABC books (we're talking obsessed) so we go over it a lot. When he wants to sing the alphabet he always sings "aaaaay" ... I love it! I might just steal this idea though to help solidify it in his mind. What a cute idea!! I can just see Espen singing about "A" all over the house! I'm sure you're teaching Espen colors, shapes, and numbers. I'm sure you're teaching him how to color. I'm sure he's learning other skills he would use in school. Why is this so different? The great thing is he's having fun learning. AND he's learning little by little what it will be like to be in a classroom setting of sitting down and learning. (My nephew can't sit down for his life! He wants to do what HE wants to do!) And it was obviously fun for him because you could see it stuck with him! 30 in 30: Back from beyond the grave. 30 in 30: Day 16 - Mason jar/jelly jar. 30 in 30: days 7, 8, and 11. 30 in 30: Day 9 - fresh fruit.